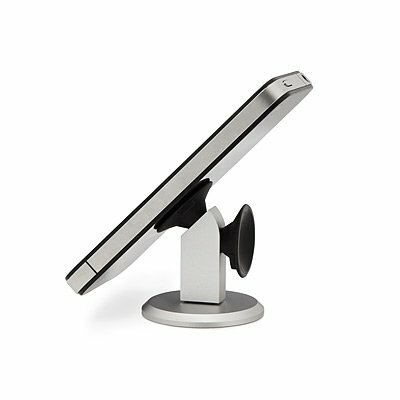 The Oona is a smartphone stand that was originally made for the iPhone 4 and 4S, but it seems to work fine with my Galaxy S4. Inside the box you’ll find two large suction cups, a small suction cup, a little bag to put the cups in, and a couple sticker things. Despite the fact that the package claims you can put this on your windshield and other high places, I highly advise against doing that. While the suction cup isn’t extremely reliable, it does hold my Galaxy S4 on my desk for long periods of time. I also recommend putting some moisture on the suction cup prior to putting your device on it that way it sticks there. What I really like about this stand is that you can also put the phone in landscape and portrait mode which I think is pretty awesome. In addition to that, it works for pretty much any smartphone and that you can also swap out all the different suction cups and get a better angle for whatever you’re doing. One negative I have found is that the suction cups aren’t strong enough to hold your device on a windshield or anything like that. Also, I would’ve really liked to see a material on the bottom of the base of the Oona that made it not so slippery. Hopefully you guys enjoyed this quick review of The Oona. Links are below and be sure to check out my video review above.